The Australian Fleet is not merely the embodiment of forces. It is the expression of Australia's resolve to pursue in freedom, its national ideals and to hand down, unimpaired and unsullied, the heritage it has received and which It holds and cherishes as an inviolable trust. It is in this spirit that Australia welcomes its Fleet, not as an instrument of war, but as a harbinger of peace'. What Is A Naval Review? The first recorded (Royal) Naval Review was staged in 1415 for King Henry V who reviewed his ships prior to their sailing to battle against France in the 100 Years War. Since then many reviews have been staged. In the earliest of times the Review was in fact the mobilisation of the nation's navy but nowadays is more of a display or ceremonial event. Such a ceremonial review was held in England in 1887 to celebrate the Golden Jubilee of Queen Victoria and in more recent times for the Silver Jubilee of Queen Elizabeth II in 1977. 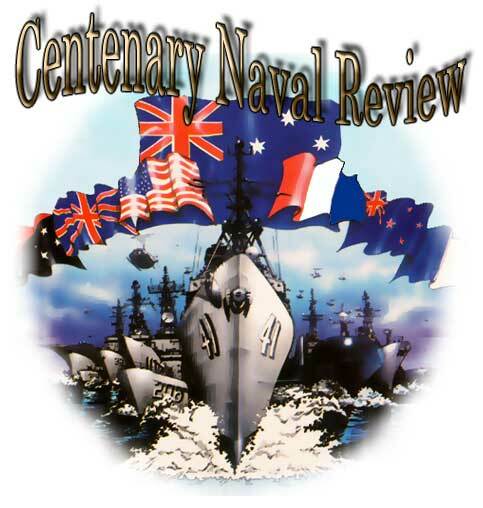 For the Royal Australian Navy a number of Fleet Reviews have been held since its inception in 1911. In Port Phillip in 1920 His Royal Highness, The Prince of Wales reviewed a massed Australian Fleet of some 30 warships and auxiliaries while in 1938 an impressive naval demonstration entitled 'Fleet Week' was staged. 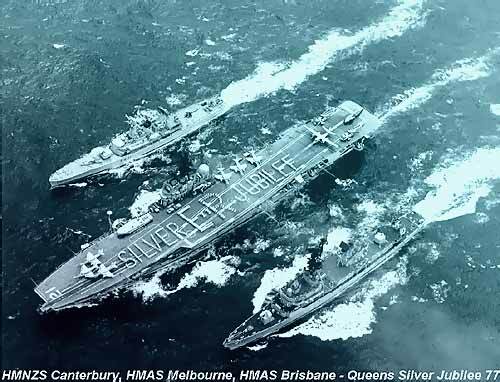 Then, in 1961, for the Navy's Golden Jubilee, Fleet units sailed into Sydney Harbour in an impressive display of the naval tradition. The last Australian Naval Review to be staged in Australia was the Royal Australian Navy's 75th Anniversary in 1986. Where HRH Prince Phillip was the reviewing officer. Perhaps no event In Australian naval history was more calculated nor more impressive than the entry of the first Royal Australian Navy Fleet into Sydney Harbour on 4th October, 1913. 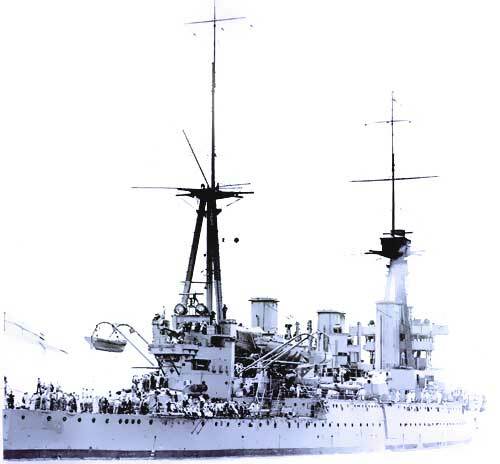 To make the arrival more effective, the Fleet Commander, Vice-Admiral Sir George Patey with his Flagship, the battle cruiser HMAS AUSTRALIA and light cruiser HMAS SYDNEY proceeded directly from commissioning in England to Jervis Bay where the remainder of the new Fleet, HMA Ships MELBOURNE ENCOUNTER, PARRAMATTA, YARRA and WARREGO were at anchor. Weather for the arrival in Sydney was perfect with 'the sun shining brightly and the harbour waters 'as peaceful as a lake'. Around the foreshores thousands upon thousands were at every vantage spot while upon the harbour, ferries, small craft and steamers of all shapes and sizes provided the welcome afloat. On the north side, all the headlands were thickly thronged and there would have been more on Bradley's Head and George's Head had the tram service been able to cope. Not only did Sydney's magnificent harbour provide all the' vantage points available but as far south as Maroubra and Long Bay, spectators filled the headlands to grasp any views of the Fleets impending arrival. Not since August, 1908 had the people witnessed the novelty of a great naval demonstration, when on that occasion 16 United States Navy battleships steamed into the harbour to a rapturous welcome. 'The sight of the Fleet meant more to the Australian people than the visit of any foreign fleet, It was our expression of Australian patriotism, ships of defence bought in love of country and empire'. With the arrival of the Fleet Unit, Admiral Sir George King-Hall aboard HMS CAMBRIAN, struck his flag as Commander-in-Chief of the Australian Squadron. Later! on 21 October, Patey assumed command, the first time that a Dominion Government had agreed to take full responsibility for the naval defence of her own seas. 'Many more thousands of enthusiastic Sydney-siders were congregated at Farm Cove and Macquarie Point where the scene was picturesque and animated and popular enthusiasm abounded. Greeting the seven Fleet units was the Prime Minister of Australia, Joseph Cook, who said that, since the arrival of Captain Cook, no more memorable event had happened than the arrival of the Australian Fleet. 'As the Former marked the birth of Australia so the latter marked its coming of age, its recognition of the growing responsibility of nationhood, and its resolve to accept and discharge them as a duty both to itself and the Empire'.